“You probably don't remember me, but I graduated from Westlawn in the early 80s . . . I really enjoyed the course - it was the right type of learning at the right time - and especially liked your helping me through some parts I had trouble with. It took a while but I eventually opened my design office in 2001 in Nova Scotia near the historic town of Annapolis Royal (not far from Digby). I did a lot of things between completing the course and opening the office and am glad that happened as I feel it was time well spent learning about different aspects of design (in general), and how to build things . . . I've been downloading The Masthead for a few years now, and like Professional Boatbuilder magazine I really enjoy the variety of topics touched on, and always read them cover-to-cover. It was while reading the Dec. 2011 issue, especially the article "Four From Westlawn Contribute Notable Designs to Woodenboat's Design Challenge III" that I realized it was time to contact you. Michael Schacht's and my Evergreen makes that five! We had fun designing this cat together, and are in the construction drawing phase, though both of us are so busy that's it's hard to see when we'll be able to complete the design. “I was hired as production planner [at Morris Yachts]. Without question Westlawn helped me get this position. I actually first saw the posting for the job I had applied for over last winter on Westlawn's website. When I was in the interview, being able to show examples of the homework I had turned in with the content, the spreadsheets and word documents created, proved I had a handle on those programs, and had been learning the fundamentals of boat design. Webb Institute graduate Carl Persak, works with his partner and Westlawn alumnus, Jermy Wurmfeld, at their design firm Persak & Wurmfeld. In Carl's recent article on their firm's management of the 281-foot Cakewalk V project, Carl had this to say about Westlawn . . .
“Time and time again, it was proven that the best equipped person to do the job was someone who could speak for the vessel as a whole, and no single decision was made without first considering stability, structural integrity, performance, or functionality. A naval architect with a background similar to the curriculum of the Westlawn program proved to be ideal . . .
“July, 1948, one month after graduating from high school, I enrolled in the Westlawn School of Yacht Design. After completing about 65% of the course, I landed a job at Sparkman and Stephens, Inc., Naval Architects, the most prestigious yacht design firm in the world at the time. The chief engineer was impressed by the samples of my designs done for the tests in the Westlawn course. I left the job in Sept. 1952 to complete the course, graduated April 1953, and returned to Sparkman and Stephens as a design draftsman. Feb. 1955 I started my own design practice and am still busy designing boats. Westlawn teaches its students to do the work that a Naval Architect does and has to do to earn a living in the profession. Westlawn still does an outstanding job. Some time ago graduated from the Computer-Aided Yacht Design and Construction course. The instructors were always available by phone to talk me through any problems I had. I learned how to design a boat by computer, convert the design to a DXF file on disk which can drive a cutting machine to configure a hull plug for fiberglass mold. Plans are in the works for just such a project. About 15 years ago, the head of the New York State Dept. of Education became very interested in Westlawn education methods. 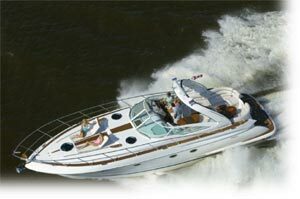 A high percentage of boats built today are designed by Westlawn-trained designers. Examples include Jack Hargrave, Tom Fexas, myself, and many others. Click HERE to see photos and details of the 43-meter motoryacht. “I enrolled in Westlawn in 1968 while still in the Navy, completing my lessons at sea in the chart room of the ship. I continued studying until August of 1974 when I had a design published in "Motor Boating & Sailing." I am currently a NAMS surveyor in Annapolis and have had my own successful business for over 16 years. I have been employed by two yacht yards and the US Navy. I spent three years on the drawing board primarily working for the Navy but doing some independent smaller design projects. In the last 20 years I have traveled to 40 countries surveying all manner of vessels from ocean going tugs and floating dry docks to yachts and high speed patrol boats. “Westlawn was a real turning point for me. I did a couple years of Mechanical Engineering, and mixed that in with boatbuilding, sailmaking and chandlery, but nothing really clicked until I started Westlawn. It is the real world of yacht design where they mix science with art which is as it should be. I know fellow designers that have taken both NA degrees as well as Westlawn, and they have all said that Westlawn was the thing that rounded out everything. 1) Working with Tommy Ericsson (general manager of Aluminium Boats Australia) we're working on a new 31 ft Aluminium centre-console for a Hong Kong client to go into production. 2) A 27 ft strip plank composite Carolina style dentre console for Kelvin from Sydney, a member of the Game Fishing Association, where they chase Marlin and the like up to 40nm offshore. 4) A 16 ft plywood offshore design similar in nature to the RipTide CX457. So keep working at your exams and with a bit of hard work afterwards, it will pay. “I started working for Ocean Yacht part time as the clean-up man, sweeping floors and cleaning the bathrooms. Then, I landed a full-time position in the rough-woodworking crew and was able to work my way up to finish-woodworker. From there, I got a position in research and development. The week I enrolled into Westlawn I was made lead man of R&D. Two year later I was promoted to foreman of R&D and production engineering. When I got to the advanced level of Westlawn, my title became engineering supervisor. When I graduated Westlawn, I started working part time with naval architect David P. Martin (designer of Ocean Yachts [also a Westlawn graduate]) while keeping my full-time position as engineering supervisor with Ocean Yachts. Not to bad for the clean-up man. The runabout Ole later designed and built entirely on his own, Destino, was selected as the best powerboat at the 2011 Newport International Boat Show. “It has been interesting for me to look at your [Westlawn] Web Site and to know that after over 70 years, the Westlawn Institute of Marine Technology, as it is now named, is still operating. In 1930, I enrolled as a student with the Westlawn School of Yacht Design and gained my Diploma in Advanced Yacht Design on 15th June 1939, signed by Gerald Taylor White [co-founder of Westlawn]. It was the start of the Second World War, and I was seconded into essential industry where I was the Draughtsman Designer with Shipbuilders Ltd. This firm was engaged in the building of Minesweepers and Fairmile Patrol Boats for the N.Z. Navy. Then, when the U.S. entered the war after the attack on Pearl Harbour, we were building 114 foot Powered Lighters for the U.S. Army and the Navy. At the age of 92, I would probably be the oldest living past student of Westlawn. After the war, Tim continued his design career with his first commission of a 27-foot patrol launch for the New Zealand Coast Guard, and then with may sailing and power boats. Westlawn graduate, Dr. Theobald was President of Queens College, Deputy Mayor of New York City, Superintendent of Schools in New York City, and Executive Vice President of New York Institute of Technology.